Longtime readers (god bless you... what is wrong with you?) 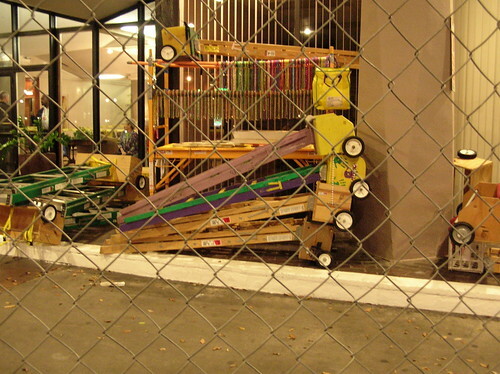 will no doubt be aware that space hogging and improper ladder placement along Carnival parade routes is a major hobby horse on this blog. But I've long argued that the solution to this problem lies in more vigorous (though not necessarily tough) enforcement of the ordinances already on the books. More draconian rules might be a bit of an overkill. “We’ll be looking at and introducing a standard set-back for ladder placement, tents and grills, eliminating roping off of sections along the median, eliminating parking on St. Charles Avenue during parades, and Napoleon Avenue two hours before and after a parade,” said Councilmember Cantrell. Cantrell also says that owners of port-o-lets who place them on public property will be fined $250. In addition, parade-goers that throw beads or throws back at floats will be penalized, out of caution for Krewe members. “We are moving forward with our ordinance and it will be effective in Mardi Gras 2014, and we will have an addition coming to it in January of 2014 that will go into effect Mardi Gras of 2015,” said Cantrell. I haven't seen the details of the ordinance yet. But I'm expecting one or two devils to show up in there.